Wait!.....What!? Two quilt top finishes in one day? Just what is in the tea you are drinking? Both are lovely. Thanks for sharing with Oh Scrap! Both of the light borders on the quilts work so well, I especially love the zig zag quilt. Great patterns for the vintage fabrics. Two gorgeous flimsies with wonderful fabrics!! I love them both. Love your zig zag quilt - that border fabric is just perfect. Such a refreshing colour palette to it. Both are fabulous but I especially love that zig zag. Those fabrics are gorgeous. Yes, the ‘outback wife’ range is very pretty & vintage-y, and mixes so well with checks & stripes & dots. Merry Xmas. Well done! They both look great with your decor. beautiful tea cup BTW. Thank you Leeanne. So glad I moved away from using the black border fabric. I popped over next door for the photo shoot yesterday, just for a change of scenery! After we had cleaned & painted it all, had the carpet cleaned and added the new drapes, we had it staged for selling! That’s all rented furniture! I thought the ‘modern’ decor would contrast rather well with my vintage quilts! Oh but the teacup set is mine! I have just two of them along with a matching cake plate. Merry Xmas. Both quilt tops are lovely finishes! They are so recognizably you! I love these outback Wife fabrics. Such glorious prints. You make a great point: the border changes a quilt tremendously. Good choices. Lovely photos. They both look fabulous! It's funny how something can sit for ages then when you next look the answer is simple. 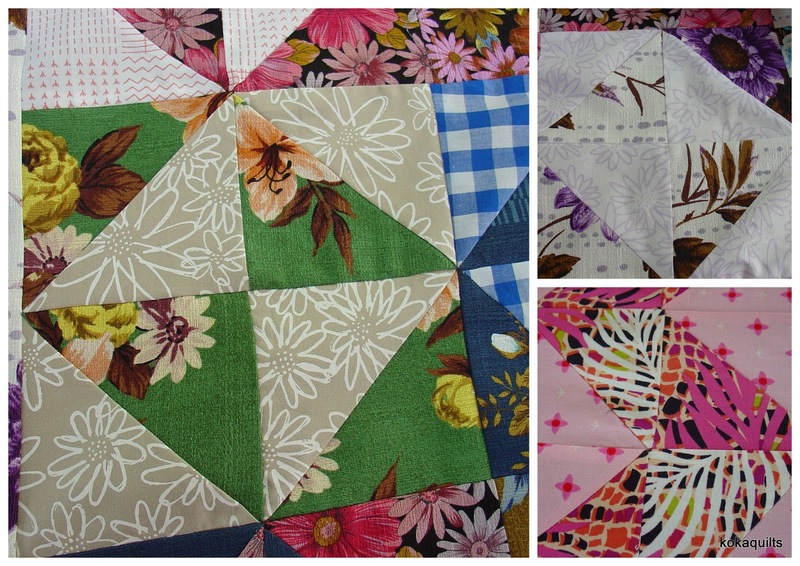 Great fixes for both and two new quilts! All your border fabrics work so well with these fun, scrappy tops! I think it's because the prints in the borders are large and have good contrast. Gives them the strength to hold their own against all those lovely scraps and bold piecing. I'll remember that for future use in my own quilts! I have to wonder about what kind of tea you're drinking too! Your quilt tops look beautiful on your sofa and bed, I like your interior colors. The design stories are inspiring. They are both fantastic looking quilt tops. Like most everybody who commented, the zig zag is probably my favorite though! The Outback fabrics are wonderful and you made very good use of them. I still mourn the fact that I missed out on this fabric! Isn't it interesting how a quilt can be so stuck and then later on, the solution can come about that seems so perfect! The lighter borders look great! Congratulations on these finishes. Happy holidays. Both sets of borders worked out so well. It's hard when you get stuck like that to decide what to try next. Congrats on getting it all worked out for both projects. It's such a great feeling when it all comes together. Sometimes quilt tops do need to sit for a while before the answer to a problem arrives. Lovely to see the flimsies finished and ready for quilting. Looking great.